Lynard Henderson (R) in Sibouli/Massacre Cultural Group drumming ensemble and Peter Letang performing as "Mighty Pig-Tail" (Photo Courtesy: Neo-Xpressions Inc). John played basketball in the national league with the Sixers basketball team from Grand Bay; he was also a basketball referee in the national and Grand Bay Leagues. 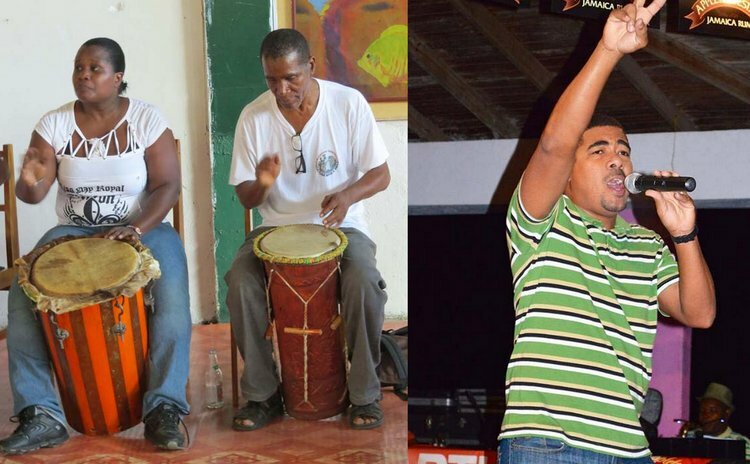 In the line of culture however, Roach contributed to the preservation of Dominica's traditional culture as an active member of the Tradibelle Cultural Group which sang and performed Bèlè and several Jing-ping (European) dances. Junior and Sylvanus are brothers from Portsmouth who played basketball with (Portsmouth) Raiders. Artistically, they have both been building costumes for royalty pageant contestants for several years now. They have also created some interesting Ole Mas costumes and revel in their own creations. Lennox was a member of the Flames basketball team. He was also a member of the Peoples' Action Theatre (PAT), and performed in such outstanding productions as Jesus Christ Super Star. "Hendo" first played basketball in the national league with Sixers and subsequently he served as player-coach of the Police Sports Club team for several seasons. On stage, Lynard is the current leader of the Sibouli/Massacre Cultural Group. He is also skilled in weaving Screwpine straw. Osborne was a member of the Nationals basketball team from Grand Bay, and also a member of the long defunct Ebonites band from Sout' City. Pierro, and brothers Jockey and Lambie, were all senior members of Bata Pros team from Grand Bay. Patrick was also the second member of Pros to be selected to Dominica's National Basketball Team. Lambert was also selected to the national team. [Refer to Jump Ball #1, TS, 10th October 2016]. Moreover, Lambie and Pierro were members of the popular La Jeune Etoille Chorale. Both sang with the group, and Lambert also played guitar and drummed (traditional drum) with that folk group as well. Pierre Charles also managed the popular Midnight Groovers, the longest serving Cadence band in Dominica. Jockey, on the flip-side, sang, played guitar and drummed with the popular Siffleur Montange Chorale of the early 1970s. He also wrote a few of the songs performed by La Jeune Etoille. "Pembo" played basketball firstly with Argonauts, then Cardinals, Owls and finally Pioneers, and coached the national team for some time. But Pembo also played keyboard and guitar with the Swingin' Stars Orchestra for many years, De Boys & Dem, and a small combo. He is also a well-respected judge at Calypso Finals. Peter Letang, like his cousin Daddy Chess, was a founder-member of the original X-Men basketball team that made their on-court debut around 1994; he played in the position of shooting guard with his team. Multi-talented Peter, who comes from a musical family, started playing clarinet and keyboard with Music Lovers, but currently he is a saxophonist and Band Corporal with the band, with which he has been playing for 29 years now. Peter has also been associated with Swingin' Stars for about 24 years now, having started with that band as a saxophonist; currently he is the keyboardist and musical arranger. In Dominica's Calypso arena Peter, who goes by the stage name 'Mighty Pig-Tail', is the three-time DASPA Calypso Monarch (2014, 2015, 2016), having written and arranged his own songs including the popular "Voodoo On De Port". He also wrote and arranged "Crabs" (2016) and "Apology" (2017) for 'Mighty Lugarz' for the national Calypso Monarch competition. Letang was also the bass-drummer and conch shell-blower in the Booboo-Lipsers Lapo-Kabwit band of the 1990s. Peter played basketball in Division II of the national league, firstly with St. Mary's Academy (SMA), then Lambs Bread, and lastly SMAGs (SMA Graduates) during the late 1970s to early 1980s. But off the court, Piper was a budding poet who went on to publish five (5) books of poetry, including "Piper's Dilemma" and "Favourites". He has performed at DOMFESTA (Dominica Festival of Arts) and at UWI's Literary Arts Festival. Peter first played basketball with Hoyas III, then Flames in Division I as a Guard. Walsh, however, was also the lead vocalist/drummer with the Efex Band and later, Partners in Kryme (P.I.K.) - two of our early Bouyon bands which are now defunct. Efex and a contingent of local athletes represented Dominica at the 1997 Francophone Games held in Antananarivo, Madagascar, located off the South-East coast of Africa. Rene and Roland are twins who played basketball with Pros Junior, then Sixers. They were also members of Tradibelle with whom they drummed and danced. They are the siblings of Adriana and Lynard Henderson who were "featured" previously.